Large and mid-market companies continue to adopt SAP to run their firms. But unlike departmental and point solutions, the powerful SAP platform runs every aspect of a large enterprise from mission-critical lines of business all the way to administrative and support services. For these firms, high availability is paramount; a system outage or performance degradation can cost millions of dollars. The burden of monitoring these mission-critical systems falls to corporate IT. But as companies grow their operations, SAP system monitoring has become increasingly more complex — so much so that IT personnel must devote a significant portion of their day just to make sure all systems are up and functioning properly at all times. CIOs are quickly realizing that this model cannot sustain itself. Administrators must devote so much of their workdays to SAP system monitoring that they have little bandwidth left for strategic initiatives that bring business value to their firms. The modern enterprise needs a way to protect against a catastrophic system outage, but without the prohibitively high cost of constant monitoring in terms of hardware, software, and personnel. SAP enjoys a long, well-earned track record as the go-to system for large and mid-market enterprises. The German software giant provides companies the computing power they need to run every facet of their business from enterprise resource planning (ERP) to ecommerce to administrative and support services. In an effort to become a one-stop shop for all of an enterprise’s automation needs, SAP has continued to release more modules with advanced add-on features. While these ever-increasing capabilities open up more options for enterprise clients, they also increase the risk of a potentially devastating system outage. Research shows how frighteningly valid these concerns are. A recent IDC report estimated that outages can cost a company between $500,000 to $1 million or more per hour. In response, many companies have deployed a veritable army of SAP experts to keep their systems running 24 x 7. They must not only ensure uptime, but also maintain peak system-wide performance while enforcing company policies and guarding against potential internal and external security threats. While these duties are absolutely necessary, they are also tedious, error-prone, and rather undesirable. Monitoring duties prevent experienced and ambitious SAP administrators from pursuing more valuable and visible business initiatives. Ironically, the bulk of the monitoring effort is spent verifying processes that are working properly rather than addressing issues that aren’t. Those who find potential threats to high availability are usually tasked with fixing them and cleaning up any data inconsistencies they happened to have left behind. Moreover, adding new monitored elements is a long and complicated process. Even the most highly trained and experienced teams find it difficult to sustain consistent monitoring and service levels across an SAP installation with its accompanying dissimilar system elements. With so much time and effort expended collecting gigabytes of statistics in hopes of no action being required, it’s no wonder that SAP system monitoring is regarded by IT leaders as an unpleasant afterthought. Yet, as painful as it is, high availability monitoring is absolutely necessary. The downside of an outage is simply too great. Competing solutions in this market space guard against the dangers of unplanned downtime, some of which are offered as free native add-ons. However, nearly all suffer from the same drawbacks that make conventional SAP system monitoring such a time-devouring and costly proposition. In a research we've done whopping 50% of SAP Basis engineers see their biggest challenge as the time spent on unpredictable issues. Setting up SAP system monitoring can be laborious to say the least. Often, an IT department has suffered through months and even years deploying a monitoring package throughout an enterprise. Depending on the modules in production, monitoring solutions may require specialized versions of software, further complicating installation and configuration. Using these applications for daily operations is time-consuming as well. The most mundane tasks still require significant human involvement of working through a daily checklist. This forces IT professionals into a constant reactive stance, which is always less effective in the long run than proactive and preventative steps. The time-intensive nature of conventional monitoring tools keeps businesses on a never-ending treadmill as business rules change. When relationships with other firms shift or SAP makes automated system updates, a whole new set of possible inconsistencies opens up, each requiring more staff ramp-up time. Additionally, SAP service releases have been known to change API touch points, rendering custom-developed modules unusable. Together with high turnover of IT personnel and shifting best practice standards, these changes lengthen response times and threaten the goal of consistent daily system monitoring. Most monitoring tools typically lack the at-a-glance report monitoring refinement that leaders expect. Generating reports is cumbersome, and slicing information for the needs of different departmental leaders extremely complicated. Worse yet, many analysts are forced to record these metrics in spreadsheets, which almost always leads to inaccurate, outdated readings. 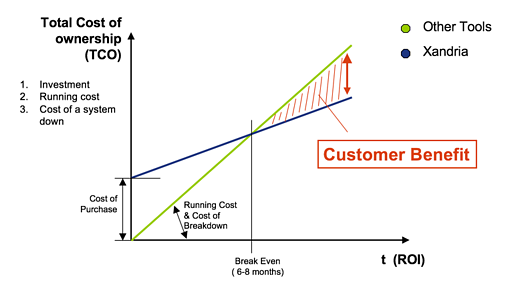 As a result, transparency suffers, which threatens promised service level agreements (SLAs). Complications of daily reporting are only magnified with audits and compliance reports, which are slow, laborious and as painful to produce as they are to read. Every IT leader knows how difficult it is to recruit, hire, and motivate good SAP administrators. But in this era of increasing workloads and decreasing talent pools, that task is becoming even harder. Keeping quality staff members happy in an environment of constant fire-fighting is becoming nearly impossible. System outages require engineers to determine root cause analysis and get systems operational again under intense pressure from executives whose bottom lines are suffering. Administrators must also constantly self-educate to keep up with the latest SAP changes and capabilities, so they can address the next problem with shorter turnaround times. These dynamics inevitably lead to frustration, job dissatisfaction, and eventually costly employee turnover. Business thought leaders agree that digital transformation will continue to be a key to sustained profitability in the global economy. This dynamic will increase the need for a robust monitoring solution. As web-enabled business relationships are forged and strengthened, the digital reach of a firm’s SAP system will reach beyond the company’s borders and into the domain of suppliers, trading partners, and even regulatory authorities. The implications for enterprise software and their accompanying monitoring challenges are anything but trivial. In addition to monitoring SAP installations, the chosen solution would also need to be capable of full landscape management. Cloud technologies will continue to enhance SAP technical value, so monitoring software must deliver the same robust results whether it operates in a public, private, or hybrid cloud topology. Only by maximizing efficiency in the entire landscape can a solution truly free up administrators’ time to tackle initiatives that bring greater business value. Other features an ideal monitoring package should bring to the table include the ability to prioritize and schedule service checks at a highly granular level and the capacity to handle big data repositories either in the data center or in the cloud. A solution should also be intelligent enough to match notifications to their appropriate level of severity, escalating to the engineer on call only when human intervention cannot be avoided. 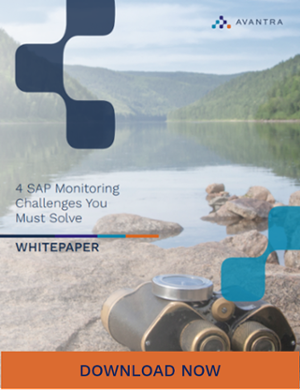 Perhaps most importantly, a monitoring package should allow SAP Basis teams to move out of a reactive stance and allow them to take a more proactive business posture. Monitoring data should feed into IT leaders’ planning and budgeting duties by providing performance metrics, and operational trend lines. Predictive analytics from collected monitoring can help leaders make decisions in two ways. Technical decisions: Graphical metrics can point out exactly which workspaces, tables, and schemas will grow and how much time will pass before engineers must take preventative action to ensure the systems can support this growth without failing. This helps IT staff prioritize maintenance tasks and allow them to accomplish all action items within their span of control before any single issue becomes a “drop-everything” urgency. Business decisions: CFOs and CTOs get a big picture perspective when formulating near-term as well as long-term budgets. By following growth trends over time, business leaders can see when they will need to allocate more budget for hardware, software, and ancillary services should their firm continue to operate on current growth curves. Far too many monitoring solutions offer only cursory data for IT and business professionals to make far-reaching business decisions. An effective monitoring solution, on the other hand, can provide stakeholders with valuable data points based on real performance metrics. They should be presented intuitively enough so that everyone from the most sophisticated engineer to the least technical executive can understand the implications clearly and unmistakably. 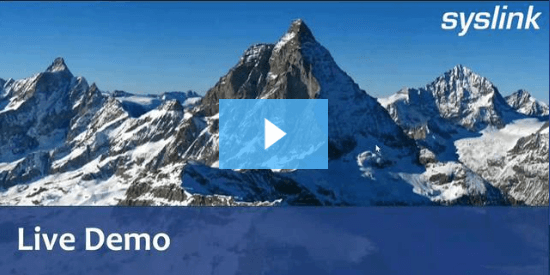 Mobility is no longer an optional function for next-generation SAP monitoring. The new enterprise support staff must be a mobile workforce. SAP has backed this up by releasing powerful applications for mobile phones and tablet devices. Similarly, Basis teams should be able to monitor the health of all operating modules from anywhere in the world on any device they happen to have with them at the time. The developers at syslink have kept all of these ideal requirements in mind when creating Xandria, their flagship SAP landscape monitoring, management, and analysis system. Xandria installs in a matter of hours, rather than weeks or months, and without the help of external consultants. Once installed, it can monitor entire system landscapes – even non-SAP components. Xandria offers extensive out-of-the-box native real-time and automated daily checks. Administrators can also create custom assessments fit to any enterprise requirement. The agent-based monitoring function automatically identifies new SAP modules as they come online, applying pre-defined manufacturing checks and parameters, so administrators no longer have to set them manually. And in the case of a network failure, monitoring data is kept at the agent level and later sent to the central console once connection is reestablished, so IT never loses important diagnostic data. These intelligent agents can also detect SAP component levels and upgrades on the fly, eliminating the need for time-consuming manual configuration by IT staff. Changes to SAP system configurations, profiles and parameters can be tracked and escalated via notification, which offers an extra measure of security. They can also be used during an audit to demonstrate proper change control tracking. Multi-point availability checks are built in to ensure availability for processing by end users. Automated reporting shows service and performance level metrics which can be viewed on smartphones and tablets as well as laptops and desktops. Xandria also provides proactive and predictive analysis that prompt IT leaders to consider new hardware when needed. The outlay for acquiring Xandria is quickly recovered across the organization at a fraction of the time of competing solutions. Not only does Xandria reduce man-hours of that army of SAP experts previously required, but it is more effective at preventing the outages that are costly and require intensive human-monitoring effort in the first place. As a result, an organization can stop spending countless hours monitoring system health and spend that time on strategic initiatives that bring more concrete business value. SAP is the most powerful enterprise business software package on the market today. But its all-encompassing nature means companies are vulnerable to costly outages. 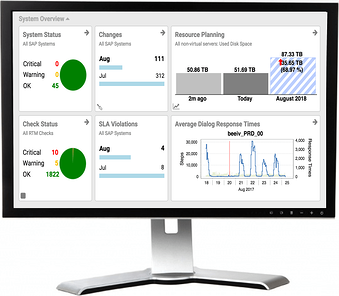 While monitoring is an absolute necessity, it becomes a very costly proposition due to complexities of installation, operation and maintenance – to say nothing of the high-priced SAP administrators and consultants they require. The SAP enterprise needs a solution that simplifies monitoring – reducing the investment in time and manpower so that the IT department can take on initiatives that provide greater business value. At the same time, the solution must provide preventive maintenance capabilities and the robust, customizable reporting needed by the many stakeholders in a medium to large-scale operation. Xandria by syslink offers all these capabilities and more, with an intuitive, easy-to-use interface and outstanding support. Created by experts with a deep understanding of SAP best practices, Xandria simplifies operations, reduces complexity, and delivers superior e-business advantages for SAP clients. While there are various monitoring tools in the market, not many can show you 20 years deployment exprience and some of the largest MSPs and SAP customers in the world that are using their product. Syslink Xandria monitors over 10,000 SAP systems and over 1,000 HANA systems. Contact us and we would love to share it with you and show you how it can make your and your team's life easier and make your SAP system better.